Free Firming Heroes Worth £35! with a £55 Spend on Caudalie! Highly natural and effective 3 step routine! Treat yourself or someone special to the luxurious packs and gift sets from Caudalie! Caudalie's luxurious range of cleansers and toners. are suitable for all skin type and leave skin clean, refreshed, soothed and radiant. Cleanse and perfect skin with Caudalie's Mask range. Whether your skin is feel stressed, lacking radiance or needs moisture, Caudalie's treatment mask restores skin to its natural health. A simple, natural and highly effective solution for combination skin. With it being estimated that 70% of people experience a complexion imbalance in adulthood (25 years and over) and up to 87% are affected by the problem in their daily life, this range is ideal for helping offer a solution to the skin concerns of the nation. 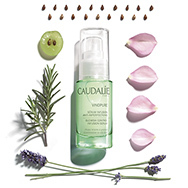 Created to combat skin issues encountered by those with combination-to-oily skin, Caudalie Vinopure uses natural-origin ingredients (97-99%) with no synthetic fragrances. Vinopure features a new patent developed by the Caudalie laboratory, based on the unique combination of grape polyphenols and a cocktail of the six purifying organic essential oils of lavender, lemongrass, geranium, rosemary, lemon balm and peppermint. The active ingredients in the formulas work simultaneously to form an effective barrier against the production of the P.acne bacteria, responsible for blemishes and stops the oxidation of sebum, the main cause of pore inflammation and complex dullness. A highly natural hydrating range formulated with ultra-moisturizing and soothing. Caudalie Vinosource offers 5 extra-sensory textures suitable for all skin types, from the most dehydrated to the most undernourished. Treat and correct all types of dark spots and pigmentation. Prevent their appearance, even the skin tone and restore the complexion’s radiance and luminosity. Protect skin against premature ageing caused by pollution, stress, lifestyle and diet. The antioxidant and Vitamin C-rich formula of Vineactiv reinforces the skin to restore radiance and smooth wrinkles. When you're too young to rest, but too young to look tired! Introducing the anti-cell burn-out complex. Harnessing the powerful anti-ageing properties of the grape and vine, Caudalie's award-winning Resveratril Lift and Premier Cru collections work to hydrate, plump and firm the skin for a youthful complexion. Discover the light and irresistible vine-inspired scents created by Caudalie founder, Matilde, alongside some of the leading perfumers in the world. Recreate the Vinotherapie spa world in the comfort of your own home. With a luxurious range of shower gels, scrubs, butters and body oils, you will feel as if you're at the heart of Caudalie's Bordeaux spa. Caudalie Suncare & Self-Tan range has been formulated with protecting anti-oxidants polyphenols. Caudalie suncare range provides an even, luminous and long lasting tan that keeps your skin moisturized, fortified and protected against sun damage. 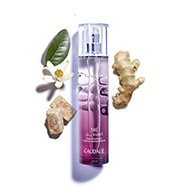 View all Caudalie products in one place. Simply select your skin type and product type. 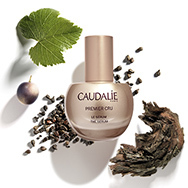 Caudalie began to appear in pharmacies in Bordeaux in 1995, starting small with just two face creams as well as supplements which were based on grape-seed Polyphenols. In 1999 their brand grew with the creation of the first ‘Viotherapie’ spa, which uses the revitalising beneficial effects of the water from hot springs located 500 meters underground on their estate. This spa is designed to offer luxury treatments using Caudalie products. Between 2001 and 2005 new products were brought out. 2001 saw the release of the anti-aging resveratrol which was part of the Vinexpert range, which has proven successful since release. In 2005 there was the release of the Vinoperfect range, this range contains sap which removes dark spots. Within this range was the Vinoperfect Radiance Serum Complexion Correcting which is a bestseller. Every so often something comes along that we just HAVE to shout about, and this delectable duo from the skincare experts at Caudalie ticks every box. 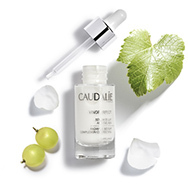 Tried & Tested – Caudalie Vinopure! In 2006 Caudalie decided to remove the parabens from all their products, ever since Caudalie has been all about strong 'cosm-ethics'. They favour natural and environmentally friendly active ingredients; the vine and grape extracts used for their patents come from the vineyards of Bordeaux, Champagne and Burgundy, and every day Caudalie scientists seek out the next “green” active ingredients to strengthen the company's 'cosm-ethics'. Caudalie use a variety of naturally sourced ingredients such as plant oils, moisturising active ingredients, fair trade shea butter, natural emulsifiers, and extracts of the most fragrant fruits and plants to create their cult favourite products which truly care for your skin. 2009 was the year of “Crème de la Crème” which was a result of 7 years of research. The blend of original Caudalie ingredients within this product – Resveratrol, Polyphenols and Viniferine – mixed with molecules used to combat ageing. This product tackles a variety of skin concerns such as wrinkles, dark spots, dryness and dull complexion. In recent years Caudalie had decided to donate 1% of their worldwide turn over to help implement environmental projects, therefore from 2012, anyone who buys a product from Caudalie is contributing to protect the plants. Caudalie Beauty Elixir Set – a set designed to smooth skin, reduce pore size and boost natural radiance! Use this kit to leave your skin looking luminous and bright, and feeling fresh! Caudalie Instant Foaming Cleansing Duo – a generous, airy foam which gentle cleanses the skin. As it is soap free it respects your skins natural balance and leaves your skin feeling comfortable and looking great!